Marjorie Christine, known to her family and friends as "Marge," was born March 17, 1921 at the family homestead in Eldorado, Oregon to Henry and Katherine "Kate" Schoenborn. She attended Eldorado Grade School and Oregon City Junior and Senior High Schools graduating with the class of 1939. On May 26th of that same year, she married John Lewis Dunton, Sr.
Marge was a hard worker. She raised cane berries and strawberries on the old Schoenborn farm in Eldorado along side her father. She instilled the hard work ethic into her children by teaching them to pick berries for her, and later beans and berries on neighboring farms. Marge was a no-nonsense good cook. She will be remembered for large family meals, great homemade soups, and a family traditional called holupsure (cabbage rolls with rice and meat). Besides farming with her Dad, Marge and husband John kept a 30-acre farm at Liberal raising cattle, milk cows, hay, hogs, chickens (for meat and eggs), a large garden, orchard with prunes, cherries, apples, pears, quince, filberts, and walnuts. They grew what was necessary and preserved the bounty for the family. John and Marge, along with the kids, would spend days picking up walnuts in the fall, drying them, then cracking and selling the meat in five pound bags to a wait list of local customers each year. In the fall when her children were in school, Marge worked on local produce farms cutting broccoli and cauliflower. For many years she supplemented the family income as a USPS substitute rural mail carrier. In 1972, after 42 years of service, John retired from the USPS and they took time to travel, fish, work their garden, and farm together. When John died in 1982, Marge continued to work the farm until 1988 when she sold to eldest grandson, Mike Dunton. Building on the foundation of her legacy, he now operates the Victory Seed Company, an heirloom seed company, from the farm. Marge is survived by her five children; Larry (Carole), Doris Pence, Joan Deardorff (Gary), John Dunton, Jr. (Cathy), Sandra Metcalf (Jeffrey); eight grandchildren; thirteen great-grandchildren; and four great-great-grandchildren; siblings Arthur (Doris) Schoenborn, Virginia Burley, and Walter (Caroline) Schoenborn; and numerous cousins, nieces and nephews. No funeral was held per Marge’s wishes. A private internment was held at the family's mausoleum on the farm in Liberal, Oregon. 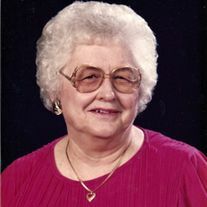 Her memorial service at the Evangelical Community Chapel at Liberal was held on January 14, 2012. In lieu of flowers, the family suggests remembrances be made to the Church at 29079 S Highway 213, Molalla, OR 97038.